It appears that the United Nations building has been undergoing an expensive renovation and update – complete with cost over runs. There seems to be conflicting reports as to the total cost of this project. The title figure comes from Wikipedia. Below they discuss large figures needed to complete the job. All World tax payers money of course. 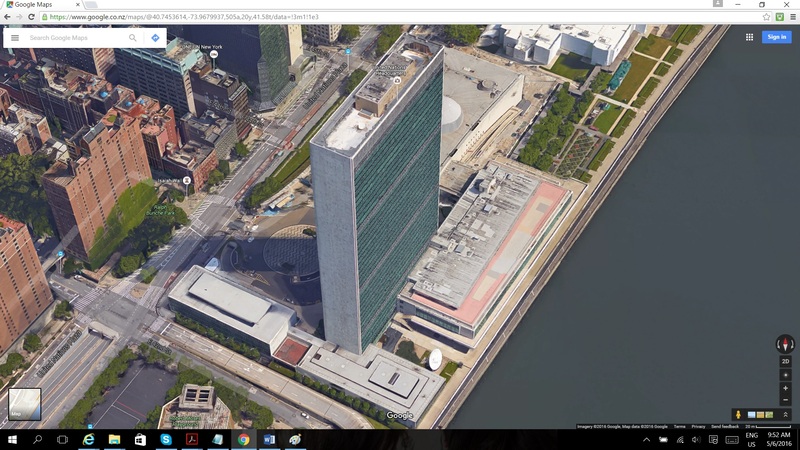 The UN Headquarters next to the East River New York. Surprised there are no docks or jetties planned for the first floor? Maybe they intend to rely on aircraft landing and departing from the roof. PS: How much sea level acceleration is actually going on? Fact. Sea level rise caused by the Anthropogenic Global Warming theory can never be a tsunami. Therefore to attain the catastrophic heights we see predicted we would expect to see an ACCELERATION in the sea level rise record. How much acceleration has been detected to date? This entry was posted in 350.ORG, Big Oil, Communism, ICLEI, PEAK OIL, Powerful Lobbyists AGW, Social Engineering, Uncategorized, United Nations Connection and tagged Agenda 21, authoritarian, Bureaucracy, bureaucracy out of control, communism, Communist, Economic collapse, extreme socialism, Global Warming, Greens, infiltration, IPCC, mindwashed students, population reduction, poverty, Power Mad Government, ruled by elite, United Nations, Wanton Political Power, world government. Bookmark the permalink. Roger, You failed to mention or connect that the entire east coast of the country is on an uplift/subduction plate and that the East coasts are continually rising due to seismic activity. Just ask the Kaikoura Harbour master how worried they are about a potential, real or imagined, few millimeters of sea level change vs the 2 meters delivered by the recent earthquake. It simply shows how irrelevant so called sea level rise is to our current society. The IPCC in several of its publications warns of 10’s of meter potential sea level rise, but if you read more deeply in the base documents, they state that this is forecast to happen some time in the future – at a time described as “millennia” which as “millennia” is the plural of 1,000 years, they must mean at least 2,000 years or greater.